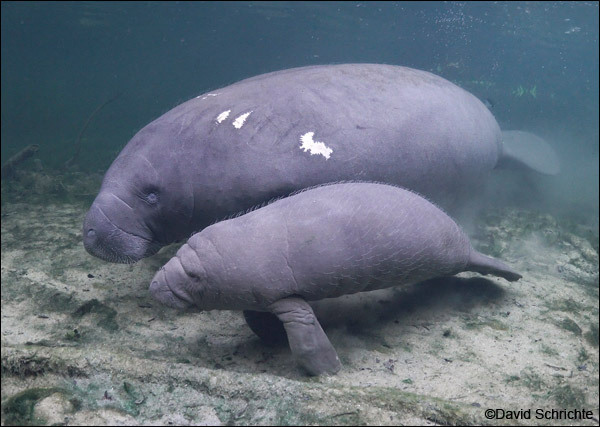 In August, Annie, one of the manatees in Save the Manatee Club’s (SMC) Adopt-A-Manatee® program, gave birth to a new calf at Blue Spring State Park in Orange City, Florida. Amazingly, this is the fourth time that Annie has chosen to deliver her calf at Blue Spring! Annie and her fourth calf. The calf was born the night of August 8th or sometime very early on the morning of August 9th at Blue Spring State Park. It is estimated that Annie’s calf was born the night of August 8th or sometime very early on the morning of August 9th. There’s no word yet on whether the calf is a boy or a girl. Annie and the calf remained at the park for about a week after the birth, where they took advantage of its protected waters. Volunteers with the Blue Spring Manatee Observer Program (SMC is a partner) spent many hours helping to keep an eye on the pair to make sure swimmers weren’t getting too close and that mom and calf could rest and move about undisturbed. Another photo of Annie and her latest youngster. If you look closely, you’ll see body hair on the calf, which is one of the many defining characteristics that classify manatees as mammals. “Once Annie has a calf, she will usually stay with the newborn at the spring for about five to seven days,” said Cora. “She swims around with the calf, and they nurse and rest. They eventually leave, but Annie comes back once in a while – probably to teach the calf the location of the spring. We see other mothers do that, too.” By the end of August, the calf was observed venturing out from Annie a bit. Wayne Hartley, Save the Manatee Club’s Manatee Specialist, announced that Annie was pregnant in November 2017 when she was visiting Blue Spring’s warm water refuge for the winter. The gestation period for manatees is about a year. Mothers nurse their young for one to two years, and the calf may remain dependent on its mother during that time. Annie is a manatee success story. She was rescued as an orphan on August 12, 2005 from the Halifax River near Port Orange, Florida. At the time, she was just a little over four feet in length and weighed only 70 pounds. She was taken to SeaWorld Orlando to grow and gain weight and was released at Blue Spring in February 2008. Annie was “tagged” and monitored for successful reacclimation back into the wild by the Manatee Rescue and Rehabilitation Partnership (SMC is a charter member). She is a frequent winter visitor at Blue Spring State Park and continues to do well. Her other three calves were born at Blue Spring in 2012, 2014, and 2016. Annie is available for adoption. For more information, go to Save the Manatee Club’s Adopt-A-Manatee® page, or call 1-800-432-JOIN (5646). 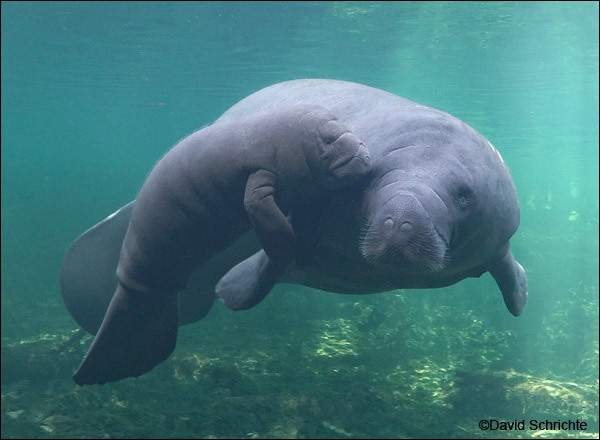 And be sure to watch for Annie and the calf this winter on the Blue Spring webcams at ManaTV.org, where you can also read updates from SMC Manatee Specialist Wayne Hartley. Annie gave birth to her 4th calf in early August 2018 at Blue Spring State Park. Watch a short video of the manatee mom and newborn calf taken when the calf was just a few hours old. Notice Annie’s distended abdomen and the still-attached placenta. Video © Cora Berchem, Save the Manatee Club.